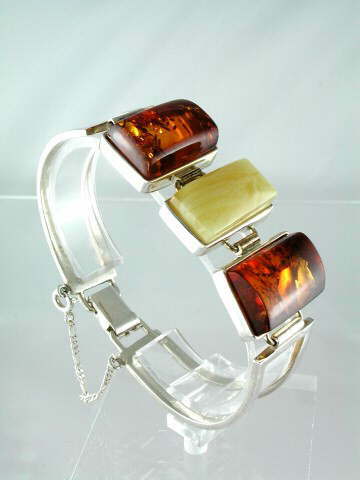 Breathtaking, majestic combination of cognac and butterscotch Amber set in a substantial 925 sterling silver bracelet, with a safety chain. In some Far Eastern countries Amber is referred to as the ‘Tiger Stone’; the stone which carries the soul, and therefore, energies of the tiger, promoting courage and strength. Although most often thought of as being golden, yellow-orange colour, it can also be found in a gorgeous creamy colour, as in this bracelet (sometimes referred to as Butterscotch Amber), deep red- orange - also in this bracelet (Cognac Amber), green and also rarely black. Some of the most valuable and rare examples come with insect or plant inclusions – many of which are now extinct species - carrying within them that particular organisms’ energy from millions of years ago. 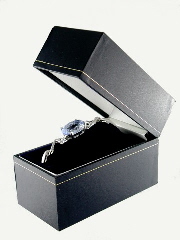 Comes beautifully presented in a faux leather, black box, with gold inlay and a white card outer. Approximate diametre: 19cm. Has a safety chain fitted.